Take a look inside, and help your child follow along with the new Missal translation! 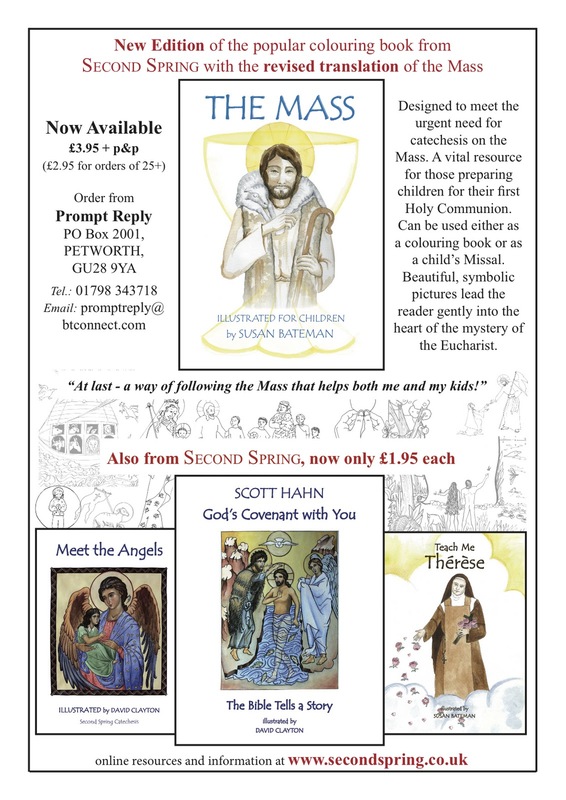 Some years ago we started our own publishing with the idea of producing high-quality artwork in children's colouring books in service of an imaginative and symbolic approach to catechesis. That simply means that rather than talk to kids about religious ideas, we would show them. Our colouring books use the symbolic language of Nature and the Bible to introduce children to the mysteries of the Catholic faith. One of our books is written by Scott Hahn. The beauty and enjoyment of interacting with the illustrations means that the child enters more deeply into the symbolism and the "visual language" of faith - the same language we find in icons, illuminated manuscripts, stained glass windows, mosaics, and frescoes. Second Spring Catechesis involves taking the child, and the child’s sensibility and culture, much more seriously than most other forms of catechesis have done. 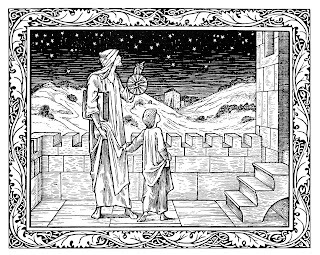 It opens windows in the child’s imagination through which the vision of the faith can be transmitted, or (to vary the metaphor) it prepares the ground and plants the seeds for a later, more intellectual appreciation of the faith in the child’s mind. To nourish the child’s sense of mystery and of the sacred is essential for the healthy development of the life of faith and prayer through the difficult years of adolescence that lie ahead. 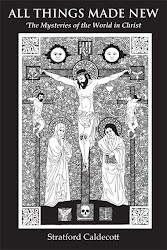 The further benefit of exposing children at an early age to a wide range of rich and beautiful imagery lies in helping to perpetuate the best artistic traditions of Christianity. By fostering an appreciation of how icons function to express religious truths and support the interior life, Second Spring Catechesis thus complements and extends the work being done for an older age group by David Clayton in Thomas More College’s “Education in Beauty” program. 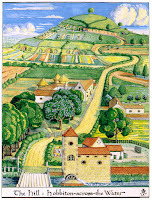 Indeed David himself has illustrated two of our books for children, adapting his knowledge of traditional styles and techniques for the purpose. 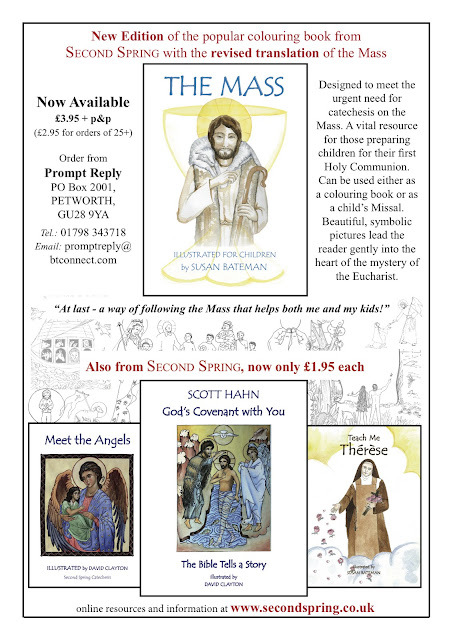 New titles are in preparation for next year, but in the meantime we hope you will order THE MASS for your parish or class, either through our UK distributor Prompt Reply, or if you live in N. America through our US distributor, Thomas More College, who can also give you current US prices. Consisting of around 100,000 little black and white pictures with captions, interspersed with many gorgeous full-colour themed pages like this one, I See All (click on title for link) was billed as the "world's first pictorial encyclopedia" when it started appearing as a part-work in 1900, edited by Arthur Mee. Like the more recent Look and Learn, which I wrote about earlier, it is available online or in ebook format. My family inherited a set of the bound volumes, and I remember poring over it as a child. The imagination of a child invests such things with an intensity of life and colour - and an "atmosphere" - that grown-ups have mostly forgotten, until perhaps they chance on an old comic book or encyclopedia and experience a wave of nostalgia. We learn more from these experiences of beauty than we can put into words. I will be featuring some of the colour pages from this publication in future posts. They may be useful or inspirational to someone. I take this out of its context, where he is talking about female education in particular, to encourage you to go to the original. The passage ends with the famous motto: "if a thing is worth doing, it is worth doing badly". One way into a study of medieval history for some children is the aesthetic pleasure of heraldry - an imaginative delight in the visual symbolic language employed by feudal knights to distinguish themselves in battles and tournaments. 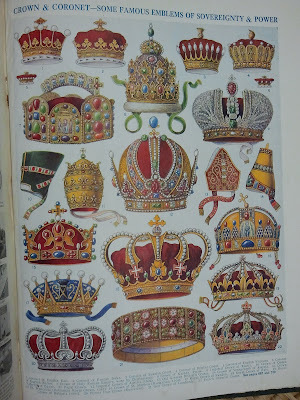 The Church still has her own elaborate system of ecclesiastical heraldry, devising formal emblems for bishops and popes. Another angle would be especially appropriate for families reading Tolkien's The Lord of the Rings. Not only did Tolkien develop several viable languages for his "secondary world", including varieties of Elvish, but he even devised a series of mandala-like heraldic emblems for the different Elvish houses - you can find them online here or here. Some children will be fascinated with these, and they could be used in many different ways by homeschoolers (as I suggested in a previous post). For example, you could explore the symbolism of shapes and colours and how these relate to the story, or you could make black and white versions to colour in, or you could invent new ones (for example make a heraldic emblem for your own family or those of your friends). This in turn could lead you to compare Tolkien's symbology with traditional European heraldry. 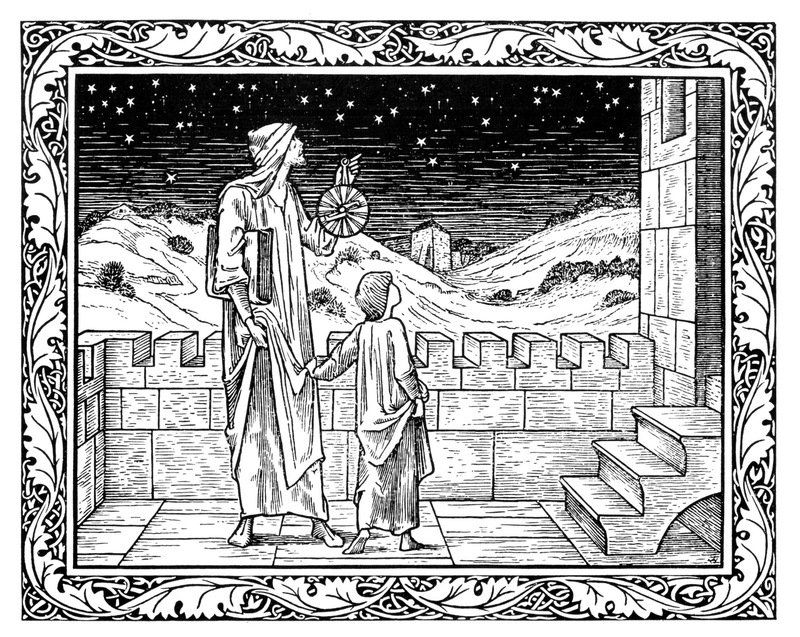 The subject also opens the door to possible discussions of symbolism in general, and of tradition, and of chivalry. You might like to read Chesterton on "pictorial symbols" in his book The Defendant, the chapter on Heraldry, or passages in his novel The Napoleon of Notting Hill where he talks about the "ancient sanctity of colours" and at the end of The Man Who Was Thursday where the six protagonists are clothed in symbolic vestments representing the days of creation... Then again, there is the whole subject of chivalry, that code of male ethics with which the Church tried to channel the aggression of feudal Europe in a more spiritual direction - but that calls for a separate post. These parents know exactly what they are doing. Here is Karen Edmisten: "Most of us would probably agree that in many areas of our society specialization can and does lead to fragmentation. Parsing education into subjects, which are then studied in a vacuum apart from other subjects, can also lead to a fragmented understanding of both the subjects and the world around us." Contrast the method or "unmethod" described in action here, in which history is full of literature, literature marches through history, history is interlaced with science, and everything points to Faith, because everything is connected with the Reason of everything. There is in fact a deep compatibility between the radical homeschool or unschooling approach to education and other manifestations of the Catholic understanding of human nature. Natural Family Planning, like unschooling, is regarded by many as an impractical ideal or an ideology, but when practised in the right spirit it reveals itself as something else entirely. The point about NFP is that it requires mutual respect and attentiveness to the whole person of the spouse. It should not be treated as just another instrument for achieving the aim of reducing fertility. For a couple to master NFP is to for them to grow in mutual love and knowledge. Similarly, unschooling is based on respect for the child and love between generations. And yet the accounts in the book underline one important fact. It seems that, to be realistic, one must acknowledge that the success or failure of the unschooling as well as the homeschooling approach depends in large part not just on the individual child and his motivation, but on the family as a whole, especially the parents. The flourishing of any individual requires the right kind of attention from others. Precisely because unschooling is a spirituality, it will only succeed (on almost any measure of success) if the family is of a certain type or has a certain maturity. As Cindy Kelly says in her chapter, “The most powerful way to encourage my sons to enjoy a new area of learning is to model it myself and continue our dialogue about their interests and mine.” Not every parent is capable of that; not all have the leisure, confidence, or motivation to do so. But for those who do, I can imagine - after reading this book - that it might work beautifully well. Reviewers of Beauty for Truth's Sake have been kind, but even the most ecstatic would admit that there are weak and even silly patches in the book, especially in the chapter called "The Golden Circle", where I play with some ideas relating theology and mathematics (inspired by Simone Weil's work and Vance Morgan's excellent book on her). Apart from anything else, I came up with a concept called "the Golden Circle" and wasn't able to develop it properly, since I lack the mathematical ability to do so. The "Circle" was simply a Golden Rectangle inscribed in a circle, which I thought one could use to explore the relations of Pi to Phi (Φ and π are connected together by the fact that the Golden Rectangle’s diagonal forms the diameter of the circle). But my conception of the Golden Circle has evolved, and Michael Schneider has kindly redrawn it for me on the right (an intermediate stage was discussed in an earlier post). The Golden Circle itself is now a Golden Ring, shown in yellow. There are in fact three circles, one inscribed within the short sides of a Golden Rectangle, one inside the long sides, and one through the corners of the rectangle. On the basis of Pythagoras's Theorem, a large number of relationships can be established between areas and lengths in this figure, since we know that the circumference of a circle is Pi multiplied by the diameter, and the area is Pi multiplied by the radius squared. 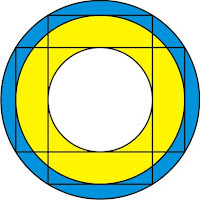 For example, the circumference of the middle-sized circle (the outside of the yellow ring) is Pi times Phi. But I'll leave you to work out what the rest of them are. Let me know sometime. It might make a nice exercise for a geometry class. The theology can wait. There is no clearer distinction between the literary and the unliterary. It is infallible. The literary man re-reads, other men simply read. A novel once read is to them like yesterday's newspaper. One may have some hopes for a man who has never read the Odyssy, or Malory, or Boswell, or Pickwick; but none (as regards literature) of the man who tells us he has read them, and thinks that settles the matter. It is as if a man said he had once washed, or once slept, or once kissed his wife, or once gone for a walk. The Cosmati Pavement in Westminster Abbey was underfoot when the Pope met the Archbishop of Canterbury in 2010, and when William married Kate in 2011. It is the traditional site of royal coronations -- 38 kings and queens have been crowned on this spot since 1268 (the symbolism of the ceremony is analysed by Aidan Nichols OP in his book The Realm). The Pavement is a kind of Western "mandala", a representation of the entire cosmos based on squares and circles and sacred numbers. I have posted about it before, but there are things to add. 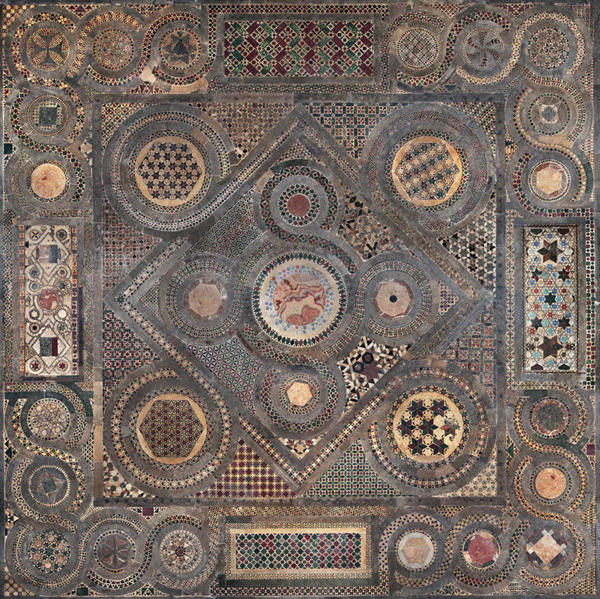 For one thing a much more detailed image of the entire Pavement is available here, on the Getty web-site. There was a Latin inscription to accompany the Pavement which described the age of the world from beginning to end as 19,683 years - the lifespan of the macrocosm conceived as a living creature. However inaccurate this is in terms of modern cosmology, it was an attempt to make the Pavement an image of the whole of space-time. We lost our "Theory of Everything", and modern science has been trying to get it back ever since. To be clear, accommodating Christian and other religious voices would not make universities Christian. They would remain secular in the sense of being neutral. Religion wouldn’t rule. But it need not be ruled out. Universities wouldn’t be officially Christian unless they somehow privileged Christian viewpoints. That would not be good even for those Christian viewpoints. We need to keep them honest, and you do that by leaving them open to discussion. This seems to be a good example of the right kind of "post-secularism" -- what many Catholic thinkers these days are calling "a new secularity" genuinely open to truth, unlike the "liberalism" wrongly so called, which closes the mind in advance by operating with a narrow conception of both reason and freedom. One of the great resources of modern Catholic thought is the international review Communio, edited in the English language by David L. Schindler. Founded in the wake of the Second Vatican Council by Hans Urs von Balthasar and Josef Ratzinger with Henri de Lubac SJ and Louis Bouyer, with the support of Karol Wojtyla in Poland (later John Paul II), it has never sold in huge numbers but has had and is having a huge if indirect impact on the Catholic Church through the fact that many of its contributors and editors have been appointed bishops and cardinals, often placed in key positions (Francis George, Marc Ouellet, Christoph Schonborn, Angelo Scola, and of course Ratzinger himself are the most obvious). Communio theology is an expression of the Catholic ressourcement or "back to the sources" movement that partly influenced the liturgical movement and the Second Vatican Council, and is certainly now influencing their interpretation and consolidation under Pope Benedict. All around the United States there are Communio circles that meet to discuss articles from recent issues, but in the UK there seem to be too few subscribers in any one place to make this viable. Even in the States, many readers find Communio hard going. 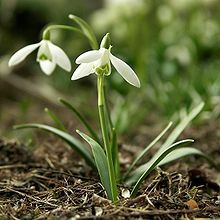 (Second Spring was founded, in part, to offer a more accessible way into this tradition of Catholic thought.) But if you are seriously interested in creatively orthodox Catholic thought, Communio is indispensable. The journal has a News page which is a good place to start, and this has links to a number of articles. I have selected several important Communio articles for our own site, which you can find under author in our Articles section linked from the menu at Second Spring. Look for example under Bouyer, Crawford, Granados, Hanby, Henrici, Kaveny, Lopez, Melina, Nault, Olsen, Ouellet, Schindler (D.L. ), Schindler (D.C.), Schonborn, Scola, Sicari - as well as, of course, Popes Benedict and John Paul II. There are also several recent ones on Catholic social teaching to be found in the articles section of our "Economy" site - Abela, Berry, Cloutier, Healy, Schindler (both), and Walker. 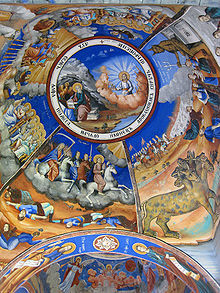 And for an introduction to Balthasar go here. 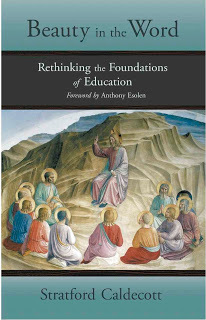 I hope to write more about Communio and education in the future. 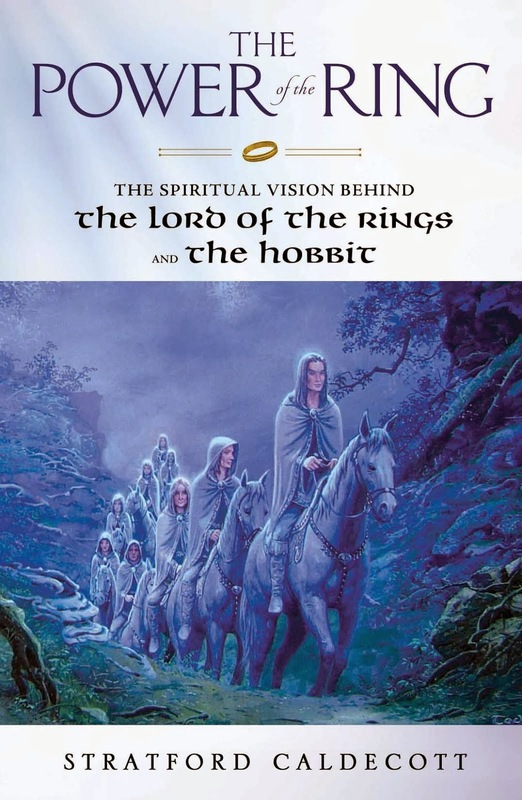 Here are some thoughts on the possible use of The Lord of the Rings by homeschoolers. The first thing is not to impose the book as a lesson, but introduce it naturally at an early stage. Reading to a child every day, for example as part of a bed-time ritual that can start as soon as the child is capable of gazing at a picture, is the foundation of everything. (You know this already.) 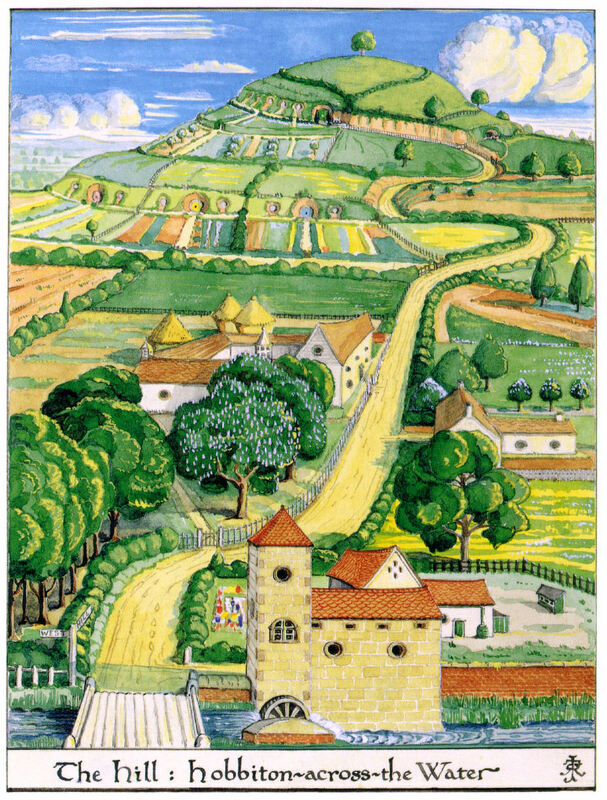 In the case of Tolkien, there are books that can be used much earlier than LoR – his Father Christmas Letters, Smith of Wootton Major, and of course The Hobbit – as well as dozens of books by other authors that can be read in conjunction with these, books by the other Inklings, traditional folklore from all over the world, and of course many wonderful passages from the Bible. It doesn’t matter that one is reading a book where the vocabulary is difficult – the meaning of a word can often be gleaned from context, although you should encourage questions and have a dictionary to hand. When it comes to LoR, reading aloud continues to be important long after the child can read for himself. The sound of the words is important. Spend a bit of time getting the pronunciation of the Elvish words right (the Appendices contain some guidance) – something I never did. The magic is in the language, as Tolkien would be the first to tell you. Once the story itself has come alive in the child’s imagination, and perhaps after it has been read more than once, it becomes possible to explore a range of topics suggested by the book. Let’s consider Language, Philosophy, Religion, Nature, Geography, History, Mythology, and Art. In his Letter to Artists, Pope John Paul II spoke of art as a bridge to religious experience: “I appeal to you, artists of the written and spoken word, of the theatre and music... I wish to remind each of you that you are invited to use your creative intuition to enter into the heart of the mystery of the Incarnate God and at the same time into the mystery of man.” The late Pope himself had been a playwright and keen patron of drama, and worked with the “Rhapsodic Theatre” in Poland. Thus the beatification of John Paul II on Divine Mercy Sunday (1 May 2011) was both the occasion and the inspiration for Léonie Caldecott’s play, “The Quality of Mercy”, performed over three nights preceding the beatification at Oxford’s Catholic Chaplaincy. Part Theatre of the Word and part Ballet of the Word, it was a multi-levelled theo-drama about youth and age, despair and modernity, vocations to marriage and celibacy. The play was the second from Divine Comedy Productions, set up at the Oxford Oratory last year. In London, Sarah de Nordwall’s "Bard School" is also concentrating on poetry and drama as a way of expressing and communicating faith. In the United States, Fr Peter John Cameron OP is also an accomplished playwright and director. An article by him on this theme is available online here. Philosophy is unavoidable, of course. As Chesterton long ago noted, everyone is a philosopher; whether you unconsciously absorb your philosophy from somewhere else (such as the newspapers) or think it through for yourself. And how you think about things shapes the way you act and behave, so nothing is richer in practical implications (even for art). Do you believe in God? But what kind of “God” is being talked about? What does the word mean to you? 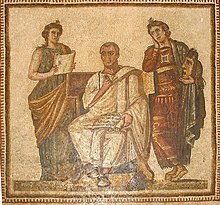 I have tried to address that question online here, and the main Second Spring web-site contains many useful articles on philosophical topics. Nevertheless, philosophy is never going to be a very effective means of evangelization. People open their minds, or change them, for other reasons than a good argument. “Heart speaks unto heart”, not head unto head, as Newman realized. The Christian faith places us under an obligation to communicate it where possible. But effective communication involves the imagination and the spirit, not just the reason or the intelligence. Just as we cannot separate the virtues of faith, hope, and love, so we cannot separate truth, goodness, and beauty. It is the heart where they join together. The way we live and the beauty we produce are the most eloquent expression of the truth we believe. You cannot communicate a truth that has not changed you, and we are changed only by a truth that we recognize as in some way beautiful. When Archbishop Cullen appointed Newman as Rector of the proposed Catholic University of Ireland in 1851, it was to spearhead the Church’s response to a scheme designed to enable Catholics to obtain degrees within the secular, utilitarian system devised by Sir Robert Peel: the Queen’s Colleges of Belfast, Cork and Galway. As Newman wrote, the University was intended to attract American as well as Irish students, and to become a centre of Catholic cultural renewal for the whole English-speaking world, “with Great Britain, Malta (perhaps Turkey or Egypt), and India on one side of it, and North America and Australia on the other.” It was an extraordinary vision, and even if this first Irish Catholic university was reabsorbed by the secular system after Newman’s departure, it had provided the occasion for a series of discourses on education (The Idea of a University) which continue to influence Catholic thinking today. John Paul II’s Ex Corde Ecclesiae (1990), defining the basic constitution of a modern Catholic university, clearly bears the mark of Newman’s thought. Fractals are infinitely complex and beautiful patterns produced through the repetition of a simple formula or shape, patterns which often appear rough or chaotic and which can be found everywhere in nature (the surface of the sea, the edge of a cloud, the dancing flames in a wood fire). I have written about them briefly before. What appeals to us in such patterns, perhaps, is the combination of simplicity and complexity. They allow our minds scope to expand, and our imaginations to take off in the direction of the infinite, but at the same time to rest in a unity. It is similar to the reason we love science. Scientists are seeking the simple secret at the heart of the complex - the formula or combination of universal laws that governs all of reality and explains why it works or appears the way it does. Something similar is happening in art, when the artist seeks unity of concept or meaning or mood in a complex scene or sight or landscape. Not all beauty is produced by these "recursive algorithms" or the repetition of self-similarity at different scales of magnitude. Sometimes a pattern is just there in the thing and does not repeat itself. But beauty always has something to do with order, which means the finding of a unity of form in something complex - a balance between the Many and the One. The finding of unity gives us joy (which is why we call it beautiful) because it enables us to recognise the Self in the Other, outside ourselves. It causes us to expand our boundaries to include the other thing as grasped and understood, or at least as situated in a relationship to us. Fractal patterns are a version of that experience. We sense the unity, but because it is expressing itself as never-ending complexity, it never gets boring. Therefore all beauty, including fractal beauty, reminds us of God, who is both infinitely simple (in himself, as pure love) and yet infinitely complex (in what he contains and creates). More notes from a work in progress. Notes from a work in progress.